Beachscape from the Waters-Edge, 5″x 7″ gouache on paper, ©2018 PJ Cook. Beachscape painting from the watersedge. Variety of warm colors in this scene from the beach. Figures in the water, on the sand and under an orange beach umbrella. Pretty painting has a little bit of everything. Working on Arches watercolor paper I started with the background sky and water. From there I laid in the violet shadow color in the dune grass. Continuing lighter and lighter values as I worked toward completion in this small gouache painting. Lastly, I painted the people and the umbrella to finish this beachscape. 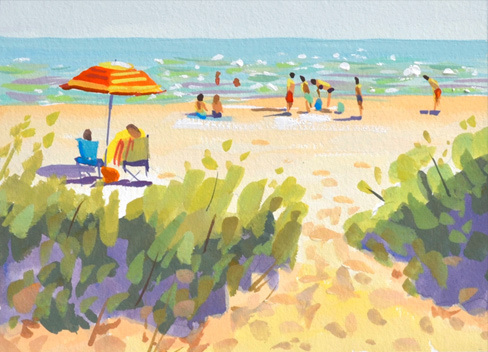 Fun, little 5″x 7″ painting from the beach!